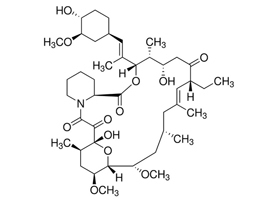 Ascomycin is an ethyl analog of FK506 with strong immunosuppressant properties. Ascomycin acts by binding to immunophilins, especially macrophilin-12. It appears that Ascomycin inhibits the production of Th1 (interferon- and IL-2) and Th2 (IL-4 and IL-10) cytokines. Additionally, ascomycin preferentially inhibits the activation of mast cells, an important cellular component of the atopic response. Ascomycin produces a more selective immunomodulatory effect in that it inhibits the elicitation phase of allergic contact dermatitis but does not impair the primary immune response when administered systemically1. Ascomycin is purified from Streptomyces hygroscopicus var ascomyceticus. 1. Hatanaka et al (1988) FR-900520 and FR-900523, novel immunosuppressants isolated from a Streptomyces. II. Fermentation, isolation and physicochemical and biological characteristics. J.Antibiot (Tokyo). 41 1593. 2. Motamedi et al (1996) Characterization of methyltransferase and hydroxylase genes involved in the biosynthesis of the immunosuppressants FK506 and FK520. J.Bacteriol. 178 5243. PMID: 8752344. 3. Arndt et al (1999) Secretion of FK506/FK520 and rapamycin by Streptomyces inhibits the growth of competing Saccharomyces cerevisiae and Cryptococcus neoformans. Microbiology 145 1989. PMID: 10463165. 4. Revill et al (2002) Genetically engineered analogs of ascomycin for nerve regeneration. J.Pharmacol.Exp.Ther. 302 1278. PMID: 12183690.